Sean Patrick Hopkins “Bob Cratchit” and Lisa Condit, The Hanover Theatre’s director of marketing & PR. Don’t miss tomorrow morning’s WCRN radio interview at 7am; “A Christmas Carol” at the Hanover Theatre with BOB CRATCHIT, also known as actor Sean Patrick Hopkins. 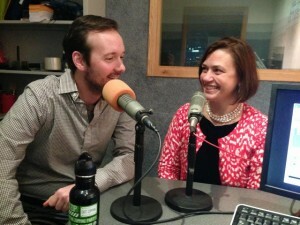 Here is a picture of Sean and Lisa Condit, (Hanover Theatre’s Marketing Director) recording the interview Wednesday. Can’t wait to hear it! If you miss click here to listen to it online. This entry was posted in A Christmas Carol, Out & About and tagged Christmas Carol, December, Lisa Condit, radio, radio interview, Sean Patrick Hopkins, The Hanover Theatre, theater, theatre, WCRN 830AM, Worcester. Bookmark the permalink.